Moscow has accused Polish foreign minister Grzegorz Schetyna of “casting shame” upon his homeland, after the politician said it would be more apt to celebrate victory over Hitler in London, Berlin or Poland. The center-right politician, who recently needled the Russian establishment with his comments about it being Ukrainian, rather than Soviet troops, who were the first to liberate Auschwitz, continued to antagonize Moscow in a Polish radio interview on Monday. “Why did we so easily accept that Moscow is the place where the end of the war is commemorated, not London or Berlin? It is unnatural to celebrate the end of the war in the place where it was started,” Schetyna, who assumed his post last year, told RMF FM. The Polish diplomat was referring to the secret protocol of the Molotov-Ribbentrop Pact, signed in August 1939, under which Stalin’s USSR and Hitler’s Germany would carve up Eastern Europe. The Germany invasion of Poland on September 1 – followed by a Russian incursion from the east a fortnight later – is usually considered the official start of World War II in the West. 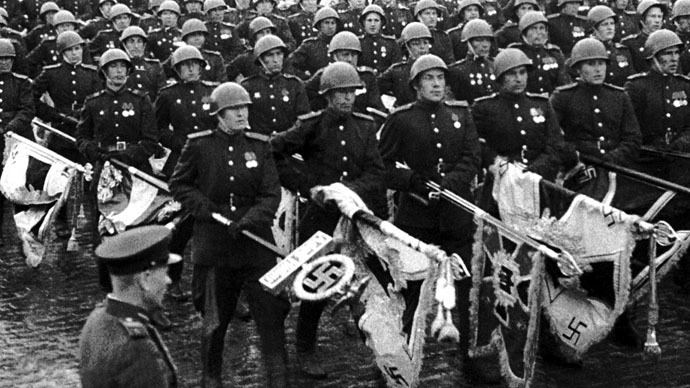 Russia acknowledges the terms of the Pact, but has historically justified it as a means of buying more time to bolster its military capacity, ahead of Hitler’s inevitable invasion. The Kremlin is hosting grand celebrations to mark the 70th anniversary of the end of the war on May 9 – the day the Soviets signed the armistice with Nazi Germany in 1945. Between 21 and 28 million Soviet citizens died as a result of the war against Germany, more than in all the Allied states put together. Moscow has invited all world leaders to attend the event and over 20 have already confirmed. But, Schetyna has suggested that instead, EU leaders should gather at Westerplatte, the first part of the Polish border breached by the Nazi blitzkrieg. “The ceremony at Westerplatte offers an alternative perspective on WWII. It also a testament to European integration since that time. The idea has provoked a lively debate, and passionate reactions,” said Schetyna. With EU leaders are keeping silent on their commemoration plans so far, and Moscow already annoyed by what it sees as Poland’s hijacking and politicizing of the date, Schetyna’s comments provoked outrage from several prominent parliamentarians. Aleksey Pushkov, a prominent deputy, who leads the foreign policy committee lower chamber of the Russian parliament, the Duma, gave an expanded explanation. “Schetyna is not only demonstrating Russophobia, but an ignorance of the facts,” tweeted Pushkov. Of Germany’s military casualties – numbering at over 4 million – 80 percent occurred on the Eastern Front.